Concentrated Lime and Mint Flavoured Soft Drink with Sugar and Sweetener. 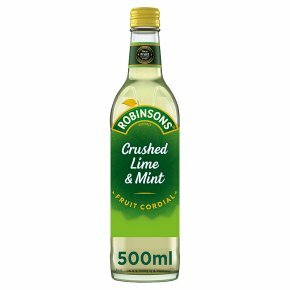 Robinsons has used its expertise to craft this delicious Crushed Lime & Mint fruit cordial. Sourcing only juicy limes which have been crushed to get every drop of juice, then expertly blended with a hint of mint. Sweetened from natural sources with no artificial colours or flavourings, with real fruit in every drop. Best served with ice and lime Shake well.